Among the Bolivian Andes winds El Camino de la Muerte, or the Death Road. 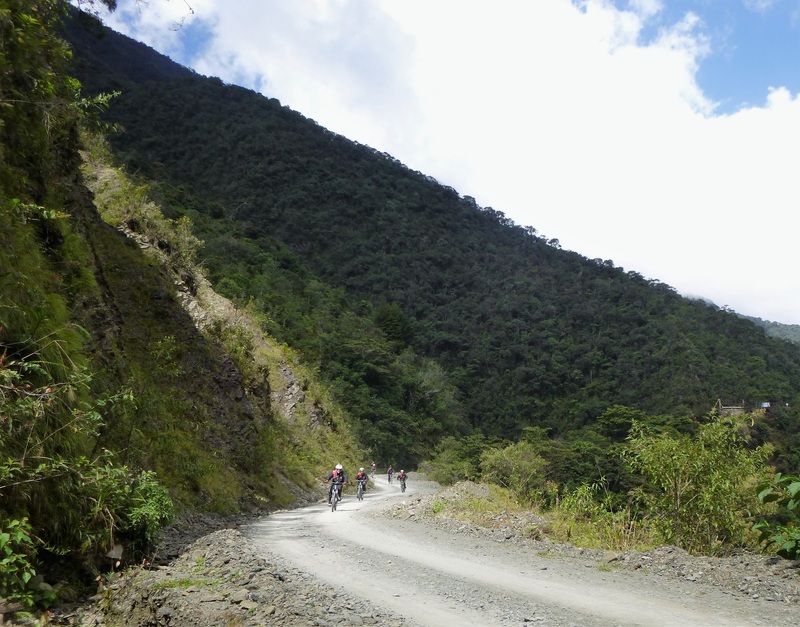 Officially called the North Yungas Road, the Death Road acquired its name as a result of its mounting death toll, which-- before a more recent route was built-- counted up to 300 people each year. The narrow, single-lane road boasts cliffs and precipices of 3000+ feet (1000+ meters) that threaten the passage of vehicles, and is considered the most dangerous stretch of road in the world. While an important transport route for locals who brave the road in trucks and risk their lives each trip, it is also a unique tourist destination which has lured thrill-seekers like myself to ascend 15,300 feet in the cool Altiplano climate on mountain bicycles before descending 4,000 feet into the Amazon rainforest. All in all, it is a 40 mile journey (64 kilometers) that attracts some 25,000 mountain bikers annually. The trip begins at La Cumbre, just outside of the capital city La Paz, in the snow-covered plains that are often dotted by grazing llamas. The cyclists are expected to ride in a single-file line with a guide leading the way at all times. The first 12 miles (20 kilometers) of the ride are downhill on an undulating paved road; for me, this was a great opportunity to get a feel for my bike while also taking in a fantastic view of the Andes mountains. Before you know it, the mountains are becoming greener and after passing through clouds (and a drug checkpoint) you've come to the start of the Old Road, which you know because of a giant sign that reads, "Welcome to the Death Road." At this point, because it is a single-lane road, vehicles – including cyclists – are expected to drive on the leftmost side of the road in order to best see if anyone is coming the other way. This, of course, is the more dangerous side. The ride continues in its descent into the jungle with few railings; you're separated from the sharp precipices by no more than the two rubber tires on your bike. The most dangerous part of the road thins out to just 3 meters wide, forcing bikers to very carefully negotiate their speed with each corner. The danger (or fun) is furthered by the slippery road when riding through cascading waterfalls and streams. After the trip, which totals 5 hours, you are rewarded a deserved (and earned) beer in the company of monkeys, parrots, bears and a large tapir at La Senda Verde Animal Refuge. 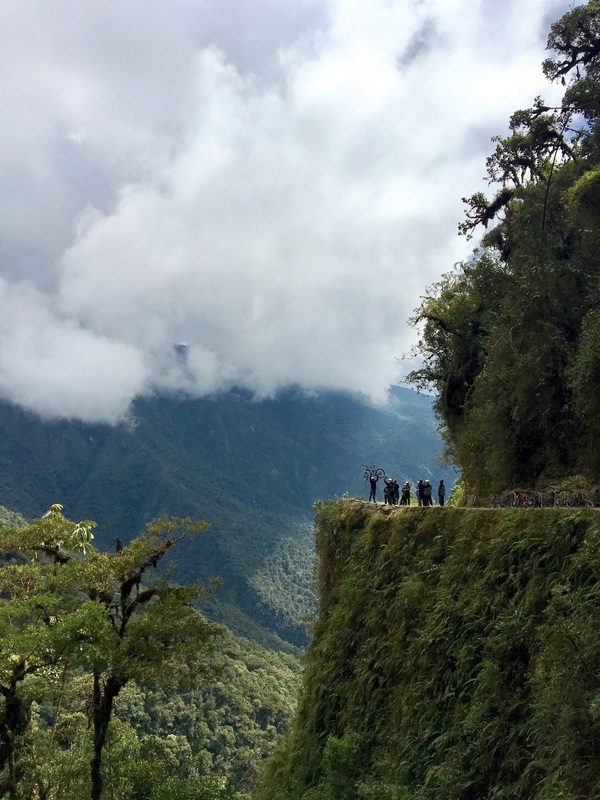 The famous Death Road may be dangerous, but it draws many tourists every year for the exhilaration of experiencing exactly that danger (and sometimes near death) while also taking in the changing landscapes and beauty that is unique to Bolivia. Enjoys breakfast, second breakfast, elevenses, luncheon, afternoon tea, dinner, and supper. Has one roommate, which is a rabbit.